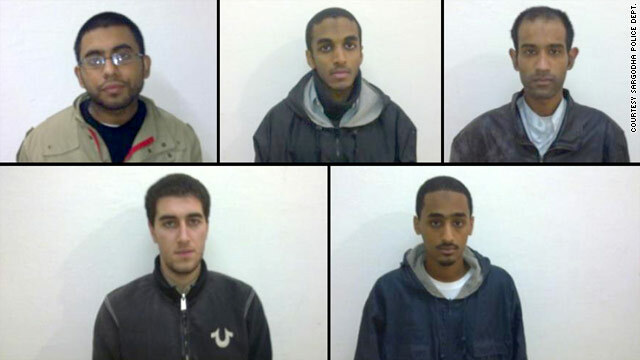 A court hearing for the five men is scheduled for January 18. A police report describes them as college students. Attorney: Men vowed "that they have no connection with any banned organization"
Islamabad, Pakistan (CNN) -- A Pakistani court Monday gave police two weeks to prepare their case for charging five Americans whom police suspect of planning terrorist attacks. Authorities have said they plan to prosecute the five men -- who are being held in jail -- under the country's anti-terrorism act. A court hearing was set for January 18. Police have said they are confident that the Americans were planning terrorist acts, according to Tahir Gujjrar, deputy superintendent of police in Sargodha, where the men were arrested December 9. Gujjrar told CNN a preliminary investigation suggests that the men came to Pakistan to wage jihad and had sought to link up with Jaish-e-Mohammed and Jamaat-ud-Dawa militant organizations, neither of which showed interest, he said. The men wanted to martyr themselves, he said. Jaish-e-Mohammed is the group believed to be responsible for the murder of journalist Daniel Pearl. But Mohammed Ameer Khan Rokhri, an attorney representing the men, said they testified on the Quran, the Muslim holy book, "that they have no connection with any banned organization," including Jaish-e-Mohammed or al Qaeda. They told the court, "We are going to Afghanistan to help the Muslims who have been injured by the NATO forces and other Afghan forces," the attorney said. And they said the didn't intend to commit any crime in Pakistan, he said. The five young men are identified as Ahmed Abdullah Minni, Umar Farooq, Aman Hassan Yemer, Waqar Hussain Khan and Ramy Zamzam. All are in their early 20s except Yemer, who, according to the interrogation report from Pakistani police, is 18 years old. Two of the suspects are Pakistani-American, two are Yemeni-American, and one is Egyptian-American. A sixth man, Khaled Farooq -- the father of Umar Farooq -- also was arrested, but was released by the anti-terror court for lack of evidence. The five men worshipped together at a mosque in Alexandria, Virginia, until they went missing in November and turned up in Pakistan. Fellow congregants at the ICNA Center said they were shocked by the arrests and accusations. Subira Farooq, the wife of Khaled and mother of Umar, said in December that she and her husband had traveled to Pakistan to arrange a marriage for Umar, and that she was surprised to see her son arrive in the country shortly afterward. The police interrogation report describes the five as college students who "were of the opinion that a jihad must be waged against the infidels for the atrocities committed by them against Muslims around the world." CNN's Pierre Bairin and Arwa Damon and journalist Fayyaz Adrees contributed to this report.